The new EP from Maiden United has arrived! And what a beauty it has become! Since I was present at the Carré show on 27 January this year, I already knew that it was Empire of the Clouds, the well-known and lengthy Iron Maiden classic, because during the Carré show, Maiden United played their version of this song for the first time. It was sung by singer Wudstik who absolutely did an amazing job that night. The EP of Empire of the Clouds consists of two parts, the studio version and the live version as it was played in Royal theater Carré. When listening to it for the first time it immediately becomes clear that great care and professionalism went into making this EP. Everything about the beautiful arrangements is worked out in the smallest details and played with a lot of dedication. After a spoken intro by narrator Edward Reekers, known for his work in Ayreon, who returns a couple more times to narrate the story about the zeppelin the R101, the completely instrumental intro called “part one” is being build up. The Hammond of Thijs Schrijnemakers, piano of Huub van Loon, cello of Perttu Kivilaakso, Joey Bruers on bass guitar and a subtle acoustic guitar by Ruud Jolie. The drums at the end of part one by Mike Coolen are very elegant. But I have to say that the sound of Perttu Kivilaakso’s cello is what really stands out. It adds this whole orchestral feeling to what you are hearing, like there is a whole orchestra supporting the band! It also gives that little bit of extra to the already beautiful arrangements. Huub’s recurring piano accords also really stand out and form the base of Empire of the Clouds. In “part two” it’s finally time for the earlier mentioned singer Wudstik to show what he is capable of. His vocals are really raw, but at the same time he has a tremendous control over his voice, he knows exactly what to do when. He continues the story where narrator Edward Reekers has stopped. You know, I can try to tell you what the EP sounds like and how beautiful it is, but truthfully, it wouldn’t do it justice. If you ask me the central power of this whole thing is that it is build up so well. From start to finish the journey of the R101 is being told through music, so when the climactic moment of the crash is there, the music heavily intensifies. Especially the drums of Mike Coolen and Perttu Kivilaakso’s cello. When narrator Edward Reekers tells about the moment of the crash and the aftermath the music calms down and receives a heavy melancholic sound. Where at the beginning of the EP, with the zeppelin’s departure, the music sounded very hopeful. 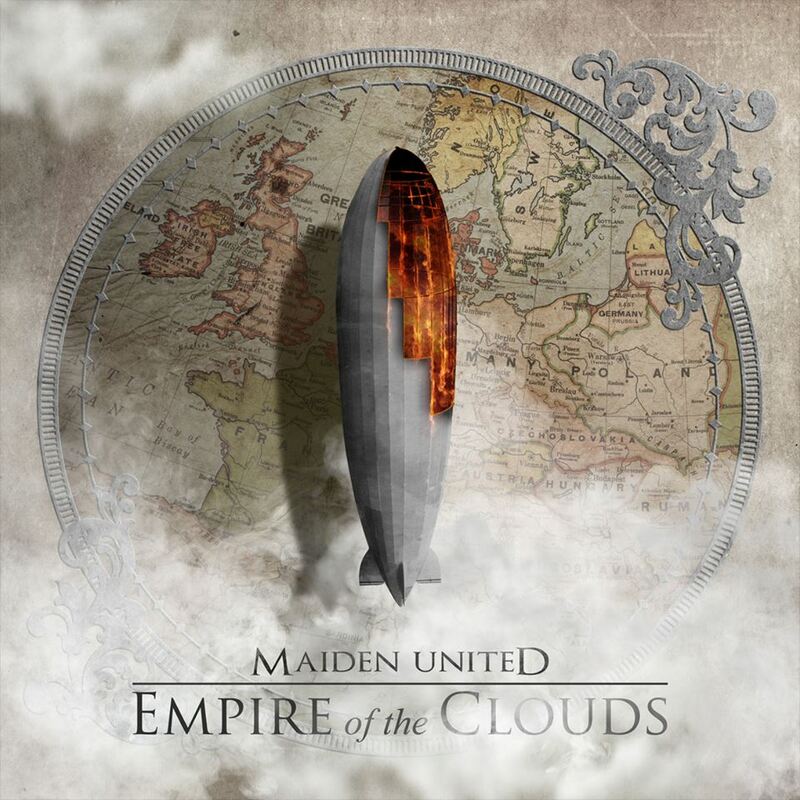 If you ask me, then Maiden United’s Empire of the Clouds is a beautifully crafted and genius acoustic arrangement of a majestic Iron Maiden classic. Maiden United succeeded in making it their own without cultivating the feeling that such a beautiful song has “just” been covered! No, nothing is “just” with Maiden United and this awesome EP is evidence of that! Regarding the live part of the EP I can only say that I’ve been there myself and that the vocals are even better performed live! What a fantastic singer is this gentleman. The fact that he supposedly was a bit overwhelmed by the beautiful Royal theater Carré, well, for me as a listener, I have found absolutely no evidence of that! The only downside to the live version was that the beautiful cello of Perttu Kivilaakso wasn’t there. I would advise every music lover to listen to this EP and not only the heartfelt Iron Maiden fans. But I know for sure that they would love it to! Here you can also read the interview we did earlier with Maiden United’s Joey Bruers.